Samsung Galaxy Note 7 smartphones are displayed during a launch event for the Samsung Galaxy Note 7 Aug. 2, 2016, in New York City. UPDATE 10/10/16: Samsung halted global sales of the Galaxy Note 7 and asked consumers to stop using both the original device and the replacement device. Read more. Samsung has temporarily halted production of Galaxy Note 7 after replacement devices catch fire, The Associated Press reports. 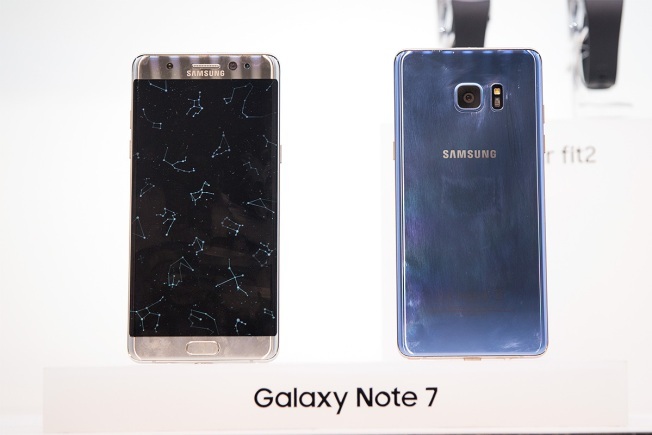 On Sunday, two U.S. mobile carriers said they will stop issuing Samsung Electronics' new Galaxy Note 7 smartphones due to safety concerns, CNBC reported. AT&T said it would stop giving consumers replacement Galaxy Note 7 smartphones because of reports that some of the replacement phones are catching fire, just as the original phones did before they were recalled last month. AT&T encouraged customers with Note 7 phones to exchange them for other products. AT&T hasn't sold Note 7 phones since the initial recall was announced. Verizon, another major seller of smartphones, said it doesn't have any Note 7 phones but said they are on back order.